Parahamsa is a celestial bird from Hindu legend, often represented as a wild swan. While the peacock symbolizes material creation, the swan stands for ethereal existence and is often paired with the goddess Saraswati, who embodies freedom of inquiry, seeking of truth, and an independent creative spirit. Parahamsa represents the presence of divine wisdom and inspiration in our world. 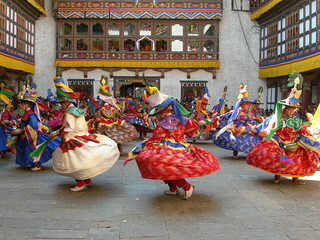 In contrast to the manmade order of a nation and ruler, the parahamsa symbolizes harmony with the greater cosmic order. This is exemplified in part through the swan’s seasonal flight, which is attuned to planetary rhythms. While grounded in the religious thought of India and Nepal, the association of the swan with knowledge and creativity also appears in Greek mythology related to the Nine Muses. In addition, images of the hamsa (or Buddhist hintha) recur in the historic and religious art of Thailand, Burma, and Indonesia.